John Dingell, the longest-serving member of Congress in American history, has died. He was 92. Dingell recently entered hospice care after being diagnosed with prostate cancer a year ago. He suffered a heart attack in September 2018. His wife, U.S. Rep. Debbie Dingell (D-Dearborn), did not attend the State of the Union address on Tuesday to be by his side. They were married in 1981. John Dingell was the former Dean of the House, serving on Capitol Hill from December 1955 to 2015 — 59 years and 21 days. On June 7, 2013, he surpassed the service record held by former U.S. Sen. Robert Byrd (D-W.V.). Dingell was elected 30 times. He spent years as chairman of the powerful Energy and Commerce Committee and was known as “The Truck.” He was a staunch defender of the domestic auto industry, which caused him to chafe with some environmentalists, even though he helped shepherd the Clean Water Act and the Clean Air Act. Dingell’s other passion was health care. Like his father, John Dingell Sr., whom he succeeded in Congress, he introduced a bill for universal coverage in every session. Born in Colorado Springs, Colo. on July 26, 1926 — shortly before the Great Depression hit — John David Dingell Jr. was raised in Detroit. Dingell attended Georgetown Preparatory School in Washington, D.C.
His father was a New Deal Democrat who was first elected to Congress in 1932 and became an ally of President Franklin D. Roosevelt. He served as a page for the U.S. House of Representatives from 1938 to 1943. According to his recollection, Dingell was on the floor of the U.S. House when FDR gave his 1941 seminal speech after the bombing of Pearl Harbor. Dingell served in World War II. He later earned a bachelor’s degree from Georgetown University in 1949 and a law degree from there in 1952. When his father died, Dingell won the seat in a special election held in December 1955. His father’s pictures used to adorn the walls of Dingell’s Dearborn office. Over the years, he represented Detroit’s westside and later, a portion of western Wayne County and slice of Washtenaw County that included Ann Arbor and the University of Michigan. Dingell voted for the Civil Rights Act of 1964, which nearly cost him his seat. He banged the gavel in 1965 when seniors finally won health coverage under Medicare. “Seniors throughout America have Chairman Dingell to thank for his instrumental role in passage of the 1965 Medicare Act and for his innumerable efforts since then,” now-former President Barack Obama said in 2009. 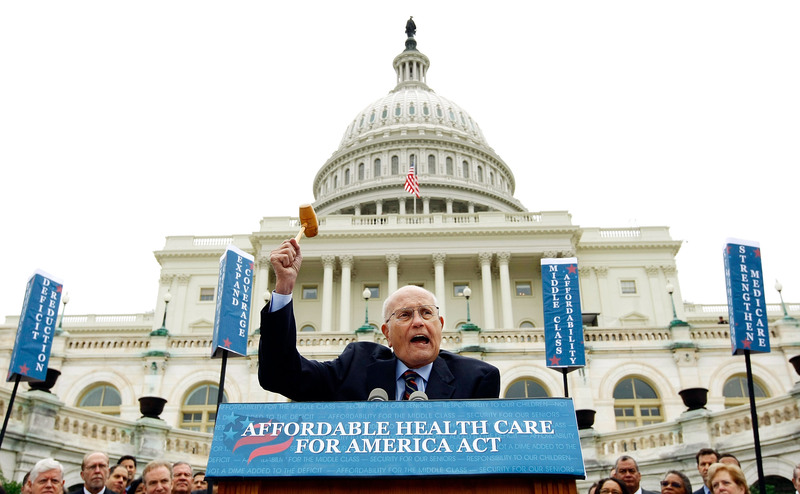 When Obama made a push to expand health care in his first term, which would become the Affordable Care Act, Dingell broke out the gavel he used for Medicare once again. The debate over health care became bitter. At a 2009 town hall, Dingell was physically threatened and shouted down as a “liar” for backing Obamacare. But when the U.S. Supreme Court upheld the law in 2012, Dingell was all smiles. Debbie Dingell succeeded him in representing the 12th congressional district. She is now in her third term. John Dingell wrote a memoir late last year called, “The Dean: The Best Seat in the House.” He had become an unexpected social media icon in recent years. with 252,000 Twitter followers. John Dingell had four children from his first marriage to Helen Henebry. One of this sons, Christopher D. Dingell, served in the Michigan Senate and is currently a judge on the Michigan Third Circuit Court.